A few weeks ago, I finally had the chance to wander around Citi Field before a Mets vs. Phillies game. My first stop was the Mets Museum. 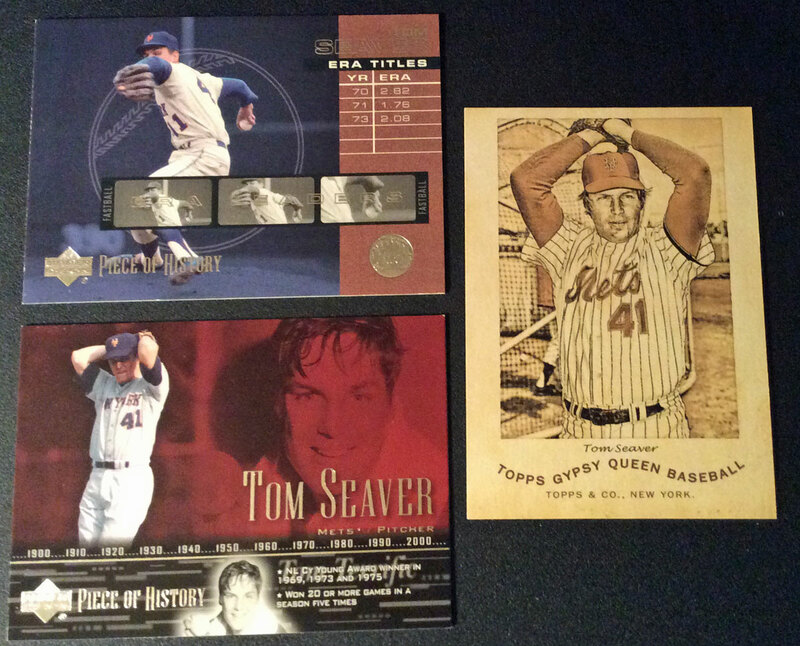 I was initially disappointed that there seemed to be less “stuff” on display than in previous years, but I think the 2015 setup actually represents the best balance between the different eras of Mets history that they’ve had since it opened. You’ve got Ed Kranepool’s contract from 1973 on display along with one of Rusty Staub‘s bats, one of Darryl Strawberry‘s batting helmets, Mike Hampton‘s 2000 World Series cap, Endy Chavez‘s jersey from the 2006 NLCS game that made him famous and Juan Lagares‘ Gold Glove Award. While it would be nice to see more of an effort to use the artifacts to illustrate a timeline of Mets history, I can see why the staff members don’t bother. The items are almost all on loan from collectors (or sometimes the players themselves) and will only be on display for one year. I recommend a visit the next time you are at Citi Field. Not exactly Topps Heritage… these two cards were printed by Baseball Cards Magazine in 1989 to entice readers to buy the monthly publication during the peak of the baseball card boom. After more than a decade of Topps Heritage sets, not to mention various other vintage-themed sets, baseball cards featuring current ballplayers on classic designs almost seems overdone. In 1984, it was a novelty. Baseball Cards Magazine included a Dale Murphy card in the style of Topps’ classic 1953 set with its August issue that year, starting a trend that continued through 1993. I say “baseball card,” but the “repli-cards” you got in the magazine weren’t exactly the same as the cards you’d find inside a wax pack made by Topps, Donruss or Fleer. Instead of the poly-bagged promo cards you might find bundled with some current magazines, Baseball Cards Magazine included an insert stapled (or glued) into the spine that was printed on thin cardboard. 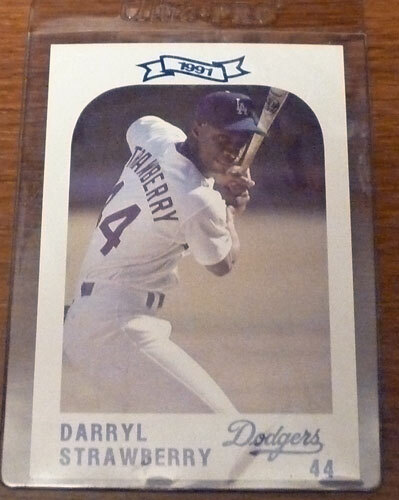 If you wanted your new collectibles to look like baseball cards, you had to be pretty good with the scissors when you cut them out from the panel. 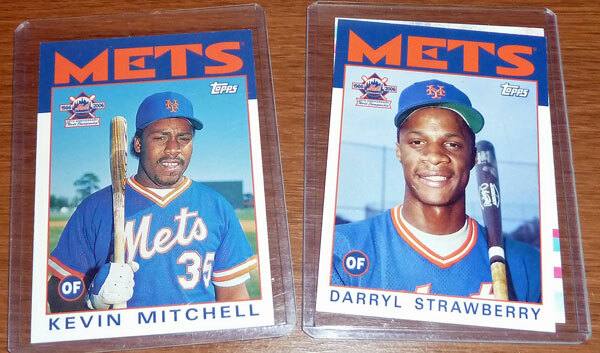 I want to thank Geof for surprising me with these Mets baseball cards (and a Mets windbreaker.) They brightened my day, and are giving me something to talk about besides last night’s discouraging loss to the Brewers. MAB Celebrity Services is holding its January autograph show geared towards Yankees fans, “Pinstripe Glory Days.” But there will be plenty of Mets stars, including David Cone and Darryl Strawberry, on hand at the La Quinta Inn & Suites /Secaucus Meadowlands this weekend. Saturday’s slate of guests includes Cone, Strawberry, Hall of Famers Dave Winfield and Goose Gossage, short-time former Mets relieverMike Stanton, former Newark Bears manager Tim Raines and former Newark Bears pitcher Willie Banks, and a host of members of the Yankees’ 1998 World Series championship team. Non-baseball guests include former New Jersey Devils Ken Daneyko and Bruce Driver, and WWE Diva Search Winner Ashley Massaro. Sunday’s guest list includes Hall of Famers Reggie Jackson and Wade Boggs, recent stars Bernie Williams and Johnny Damon, former Mets Willie Randolph, Orlando “El Duque” Hernandez, Tony Fernandez and Shane Spencer, and former Newark Bear Jim Leyritz, as well as other 1978 and 1998 Yankees players. A New York Yankees prospect will be signing free autographs with paid admission between 10 – 11:30 a.m. each day: on Saturday, it will be Nik Turley and on Sunday it will be Jose Ramirez. If you miss them this weekend, you’ll probably have a chance to see them with the Trenton Thunder this season. You can “Like” Paul’s Random Baseball Stuff on Facebook, and follow me on Twitter and Flickr. 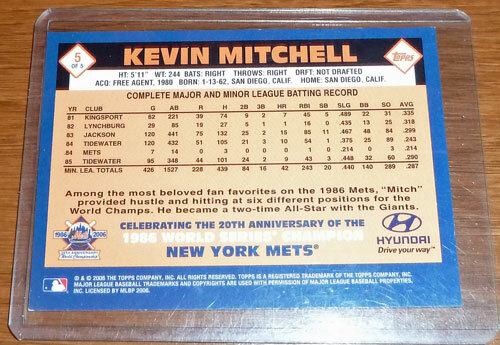 In 2006, Topps produced a five-card set for Hyundai to mark the 20th anniversary of the 1986 New York Mets World Series championship. Until I added these two baseball cards to my collection, I had never seen or heard of the set so I don’t know how it was originally distributed. 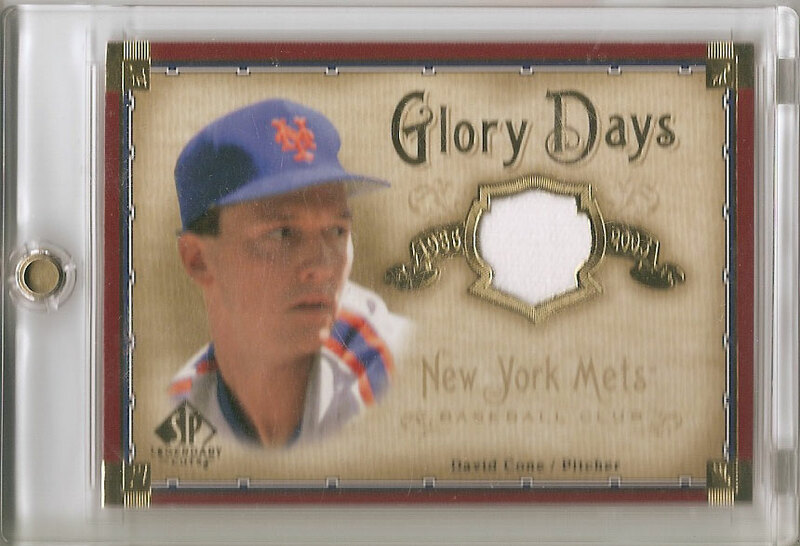 The person I bought them from said that Dwight Gooden, Lee Mazzilli and Davey Johnson were the others featured in the set. Odd not to see Keith Hernandez and Gary Carter, but nice to see some others who don’t often get recognition when the 1986 team is remembered. MAB Celebrity Services is holding another autograph show this weekend at the Fairfield Crowne Plaza. “Return To Glory” celebrates the 35th anniversary of the New York Yankees’ 1977 World Series title, but a few of the guests will still interest Mets fans. On Saturday, Willie Randolph($49-75), Mike Torrez ($22), Shane Spencer (one free with admission, $10 each additional), and Fran Healy ($35) are scheduled to sign autographs. 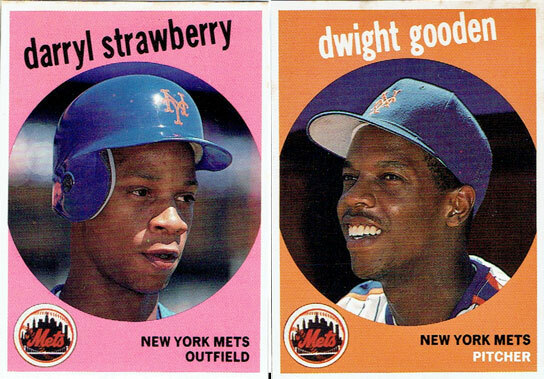 Darryl Strawberry ($39) and Ralph Terry ($30) are scheduled to sign on Sunday.